Bitnami Cloud Hosting is available as a monthly subscription. View the available plans on the Bitnami Cloud Hosting website. We also offer a free tier of service that allows you to deploy and manage one micro or small instance for free. Please note that the Bitnami monthly subscription fees are in addition to the charges you will incur from Amazon for running your servers on AWS. We have developed a cloud cost estimator to make it easy to get the estimated costs for running your servers on Amazon. Bitnami Cloud Hosting backups are complete, incremental snapshots of your server. They are based on Amazon EBS snapshots which are stored incrementally on Amazon infrastructure. This means that you will only get billed for the amount of data that has been modified on the EBS volume since the latest snapshot. Learn more about EBS snapshots. If you signed up for your Amazon account after 1 November 2010, you are eligible for one year of use of a free micro instance, plus other free services from Amazon. More details can be found on the AWS Free Tier page. As long as you meet the criteria and your usage limits are within those provided on that page, you will not incur any charges from Amazon. 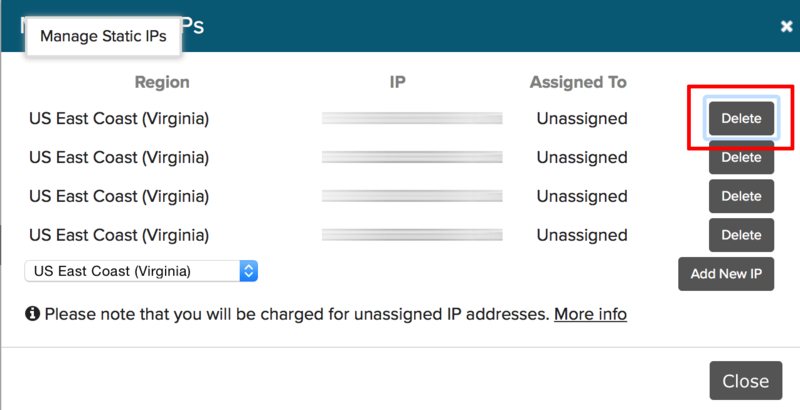 The charges that are displayed in the Bitnami Cloud Hosting dashboard are based on Amazon’s normal rates. We do not yet have the ability to account for any free services from Amazon within the Bitnami Cloud Hosting dashboard. So, in the Bitnami Cloud Hosting dashboard, what you see are the charges that you would incur from Amazon if you were not eligible for the Free Tier (or once your eligibility expires), not the actual charges that will be billed by Amazon. Static IP addresses are free when they are attached to an instance. When an instance is shut down, its static IP address is no longer considered “attached”, and you will therefore be charged $0.005 per hour until the server is running again. This adds up to approximately $3.60 per month to keep the same static IP address attached to a server if it isn’t running. Click the “Clouds” link in the left navigation panel. 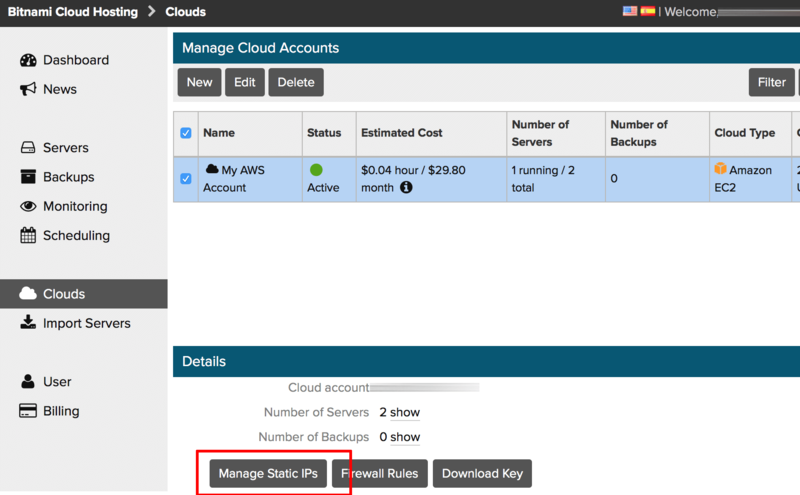 Select the cloud account you wish to use and click the “Manage Static IPs” button in the lower panel. In the resulting dialog, delete the static IP addresses you no longer wish to use. NOTE: Once deleted, the same IP address cannot be attached again later. The Bitnami Cloud Hosting monthly subscription fee is charged based on your plan selection, regardless of the usage. If your selected plan is one of our commercial plans, you will be charged even if you have no servers running. The Bitnami Cloud Hosting monthly subscription fee is charged even if you have no servers running. To stop these charges, consider downgrading to the Bitnami Cloud Hosting “Developer” plan to preserve your account - it lets you deploy and manage one micro or small instance for free. Amazon will continue to charge you for the EBS volumes (and any associated snapshots) for stopped instances, elastic IP addresses not assigned to running instances, and other AWS services you may be subscribed to. To stop these charges, delete all your running instances, EBS snapshots, elastic IP addresses and other chargeable AWS services.